I’m excited to announce a brand new ebook and my new Etsy store, A World To Discover! I invite you to come check it out to see the new publications I have available. One of those publications is patriotic in nature and out just in time to celebrate Fran’s World of Discovery’s 7th year and the 4th of July! 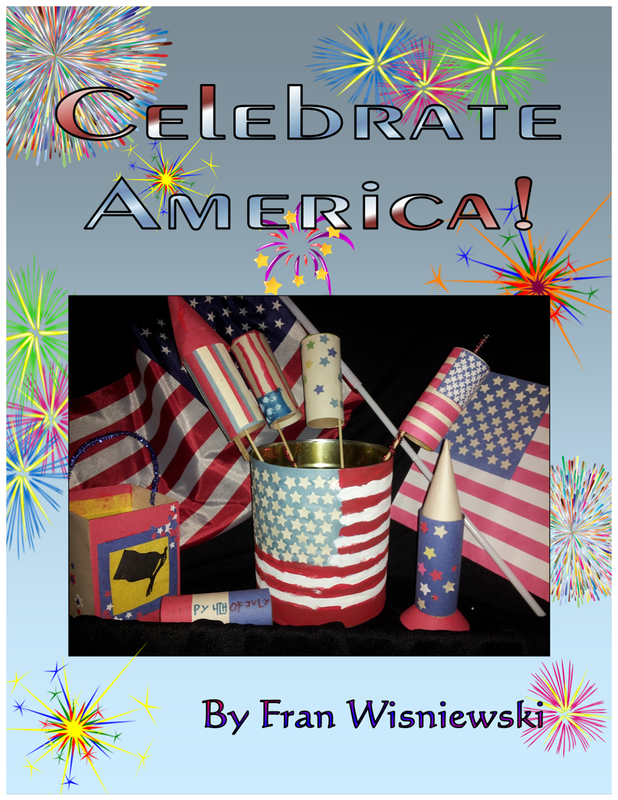 ‘Celebrate America’ is a 28 page publication, written and developed by me, Fran Wisniewski. It has more than 12 fun and inspiring family-friendly activities that include: Games, recipes, craft projects, word puzzles, and ideas that help spark creativity. Printer-friendly templates, game pieces, and coloring pages have also been provided. 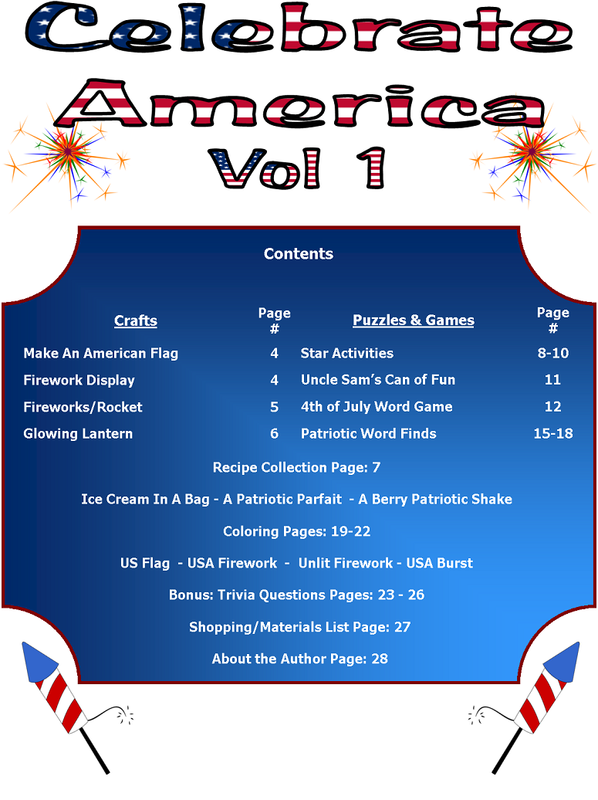 This publication is great for families who enjoy learning and playing together, self-directed learners, and anyone looking for activities related to America, or America’s Independence Day, that are fun and creative. 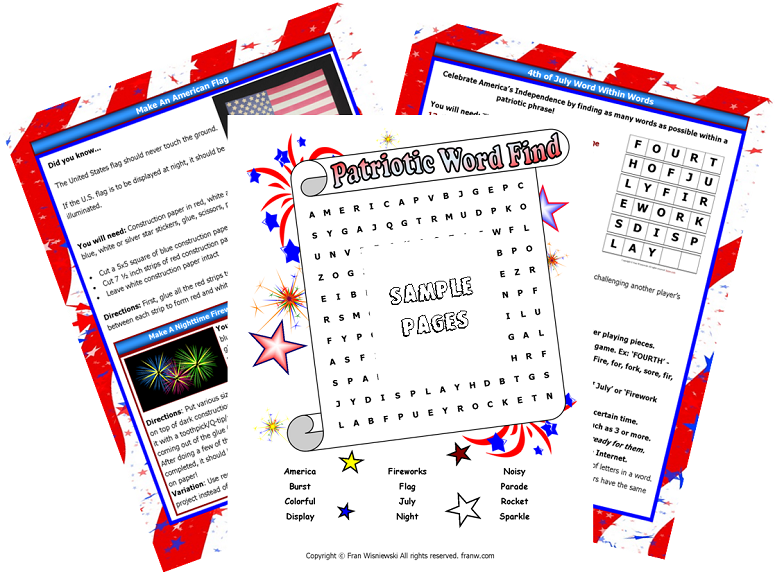 6 Craft project ideas, 1 doubles as a game, 3 Yummy Kid-Friendly Recipes, 1 Drawing activity, 2 Games, 2 Printer Friendly Word Finds w/solution pages: 1 easy, 1 more difficult, 4 patriotic coloring pages and a set of printable trivia cards. I hope you’ll take the time to check it out. Note: Has this or another post on Fran’s World of Discovery inspired you or someone else in a positive way? Have you featured this activity in a blog post? I invite you to comment and link back to where your post can be found, or tell me what you or your family enjoyed about the post! Thank you! August Special Days Vol. 1 Ebook Announcement!